The fourth novel by this celebrated French writer to be published in English, Christian Oster’s In the Train is at its heart a love story that takes off from the moment the train leaves the station. Frank meets Anne on the platform in Paris. She is struggling with a heavy bag and he immediately wants to help. From that first moment, his thoughts and anxieties unravel in a sharply focused, engaging and introspective narrative. Falling in love isn’t easy for Frank, who quickly discovers he is never standing on solid ground. Here, Oster manages the delicate task of capturing human turmoil in all its complexity—the hesitation, exhilaration and suspense; the daydreams and scrutinies; and the surprising, even alarming sensation of being carried away. Through the character of Frank, Oster opens the door to something larger, exposing and dissecting, without shame and with great humor, those thoughts and desires that can make us equally prone to passion, vertigo, and, in a pinch, to love. With his unmistakable style, captured gracefully in Adriana Hunter’s translation, Oster merges humor, distance and uncompromising honesty in order to create a novel that is in turns funny, reflective, insightful and entirely seductive. He has mastered the art of digression in order to quietly provoke an uncanny sense of expectation, a feeling of suspense. How far his potential lovers can make it together is a question that enthralls us from beginning to end. In the Train was originally published in 2002 by the influential French publishing house Les Éditions de Minuit. Read an excerpt of In the Train (in PDF) here. Christian Oster was born in 1949. He is the author of 14 novels, as well as numerous books for children. Among his previous works, My Big Apartment (1999) won the prestigious Prix Médicis, and The Cleaning Woman (2001) was made into a feature film by Claude Berri. He lives in Paris. Just prior to the publication of In the Train, Richard di Santo of Object Press interviewed Christian Oster about his novel, writing style and literary interests. Read the exclusive interview here. Adriana Hunter has translated over 40 books including works by Agnès Desarthe, Amélie Nothomb, Frédéric Beigbeder, Véronique Ovaldé, and Catherine Millet, and has been short-listed for the Independent Foreign Fiction Prize twice. She lives in Norfolk, England with her husband and their three children. 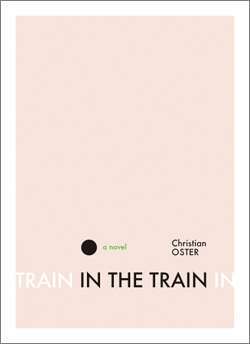 In the Train is her second translation of Christian Oster’s work, after The Unforeseen, published in 2006. Except where stated, all material copyright © Object Press, 2010. Dimensions: 5.25 x 7.25 in.